The Game Crafter (TGC) is the world’s first web-to-print game publishing company and offers a print on demand game publishing service. TGC empowers game designers around the world by allowing them to make a board game, card game, and custom playing cards through a website. Using the latest web technology, TGC developed an online publishing platform that simplifies the design, manufacturing, and retail processes related to tabletop games. Designing and publishing a tabletop game used to be extremely difficult. The Game Crafter gives designers an easy-to-use system to make a board game, card game, or custom playing cards. TGC offers templates, instructions, videos, and proofing tools to help designers create a quality product. Game designers love the service because they can purchase a single copy of their game, or as many as they need. There is no risk involved to the designer, and they can start making a profit on the first sale! Best of all, the game designer keeps the full rights to the game and can sell it to a worldwide audience through the TGC online shop. 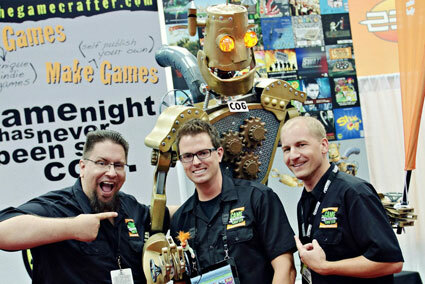 The Game Crafter was founded in 2009 by JT Smith, Tavis Parker, and Jamie Vrbsky. JT came up with the business idea when he discovered how difficult it was to publish his game. Six months later, the service was launched, and the rest is history. JT Smith is an accomplished technical visionary who develops the software behind The Game Crafter website and builds the automation used in the production processes. Jamie Vrbsky is an experienced operations manager who oversees finances, logistics, and personnel. He works hard with Heather to keep all 1,700 of our game pieces and parts in stock! Tavis Parker is a passionate marketeer who loves meeting new people and enhancing The Game Crafter brand. He stays busy with promotions, SEO, social media, event planning, and copywriting. The Game Crafter has1,700 board game pieces and parts in stock at the online shop. Game designers can purchase the parts independently or choose to add them to the games that they are designing. Game parts are sold in any quantity (no minimum orders) and volume discounts are automatically applied at checkout.